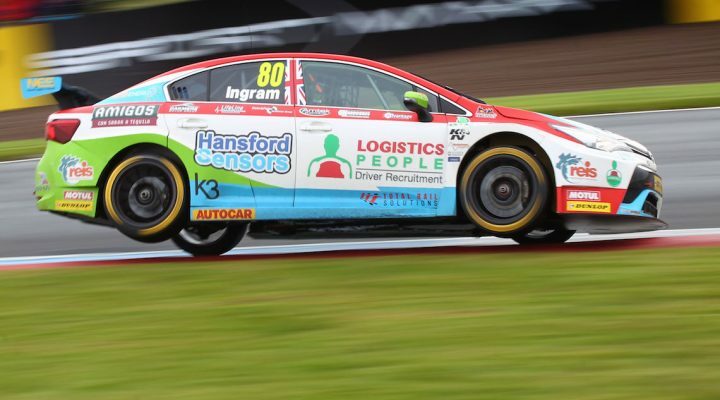 Speedworks Motorsport’s Tom Ingram topped the times in the opening Dunlop MSA British Touring Car Championship Free Practice session at Knockhill. On a damp yet drying circuit it was clear that lap times would tumble in the closing moments, and it was former championship leader Ingram that timed his flyer to perfection. With conditions improving all the time the Toyota Avensis circled the 1.3-mile track in 53.425s – albeit nearly two seconds off the qualifying lap record. Such was the rate of improvement late on that one-time pace-setter Jason Plato eventually finished down in 18th as he was relegated down the order in the final minutes. Eurotech’s Jack Goff slipped into second at the finish, as he looks to back-up his pole position at Snetterton last time out, whilst Team Shredded Wheat Racing with Duo’s Mat Jackson was third. Rob Collard provided some respite for BMW as the title contender claimed fourth, although his stablemates Colin Turkington and Andrew Jordan were left languishing down the order. BTC Norlin driver Dave Newsham delivered for the rookie squad by taking fifth overall, after briefly sitting atop of the order, whilst his team-mate Chris Smiley confirmed the pace of the Chevrolet by rising to eighth. In between the two grey BTC Norlin cars was Ciceley Motorsport’s Adam Morgan and home hero Gordon Shedden. Tom Chilton and James Cole rounded out the top ten in what was a relatively trouble free session. All 32 cars completed laps around the Scottish circuit and they will be back to do it all again at 12:50 for Free Practice Two.